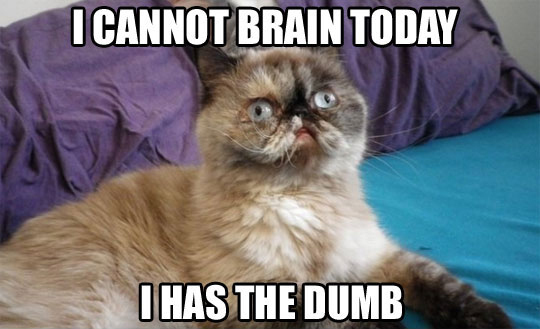 Seriously, does this cat not say it much better? I did not write yesterday. I came home from an incredibly stressful afternoon at work, brought home groceries, helped the hubby clean up for company and as soon as we finished cleaning up, company was unable to attend. Which was okay: we had the last two episodes of Penny Dreadful to watch and lemme tell you: I was hooked. But I along with groceries I came home with a headache, and when the jolt of caffeine from a 5 Hour Energy didn’t knock it out, I had to pull out the Excedrin Migraine. I thought the headache was from caffeine withdrawal, but it must have been stress, because it felt like someone was shoving a screwdriver in my left temple when I stood up. Pleasant, right? The headache did go away, and stayed away. Today has been a day of errands, and I set the mood by trying to walk to the car while balancing on the curb. I got distracted by a very pretty, deep red car (a Dodge Challenger, maybe?) and as I tried to get the hubby’s attention, I lost my balance and fell in the parking lot. Yeah, falls: not just the purview for the old or the intoxicated. I should note I’m okay. Nothing twisted or broken, though I had to scrap the knee highs I was wearing and repair a part of my shoe. I’ve got a scrape, slight swelling, and a bruise delightedly forming on my right ankle. I can’t remember how I fell, in terms of where and how I landed, so I worry about pain during the night, but we’ll see. On one hand, my physical therapist would be very disappointed in my lack of balance. Then again, I’d like to see him balance on curbs in heels. The moral of the story: don’t balance on curbs while wearing heels. Or maybe, just don’t wear heels. But my brain is all kinds of mush, and Word Press has been playing with it (or I screwed something up: if you saw a post about me talking about writing SF, it’s been deleted — it should have never shown publicly in the first place), so I think I’m going to forgo writing tonight and just get some sleep. Because tomorrow is a busy day: our toaster oven decided to stop working tonight, and we must hunt for its replacement. Next > Give Me Something More….